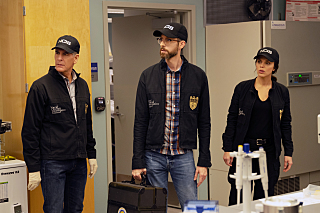 NCIS: New Orleans 5.12 - "Desperate Navy Wives"
members is contacted by an ex-boyfriend on the FBI Most Wanted List. let's see if the "Dwayne pride show" continues or not. the team worked together (with pride as the leader again - hannah had some time off), it was a good case and gregorio undercover was awesome. no triple P in this ep though and just a short appearance by loretta, but at least it felt like they are going in the right direction again. pride and lasalle trying to arrest the murderer in the motelroom was one of the most stupid attempts I've ever seen. who writes something like this? but all in all I am very satisfied with this episode. the same writers who seem to think Pride must do everything? Just got around to watching this episode earlier. Thought it was a great episode. It was nice seeing the team working together and it was not the Pride show we usually get. Love that Sebastian was paired with Gregorio on this and also that she is moving in with him! They have such a great friendship. Right? I could not believe they wrote it that way. At least wait for the guy to get in the room before yelling that he is under arrest. So stupid. Poor Gregorio getting evicted . Love hate relationship going on between her & Sebastian? LaSalle: "I'm trying to work out why you're suddenly juggling two jobs..." - yeah that's the questions the fans would like to understand too writers . Why couldn't LaSalle take over while Hannah took some time to be with her family? These episodes are so hit & miss.